Ever noticed that your skin seems to behave differently at certain times of the year? Many people with acne-prone skin, will find that their breakouts get worse in the winter months. Why? The combination of cold weather, exposure to wind, indoor heat, and low humidity can cause tiny cracks in the outer, protective layer of the skin. This damage causes moisture in the skin to evaporate when exposed to air, leading to excessive dryness, redness, and inflammation. If you’re already prone to pimples, dry skin in winter can cause more breakouts. Don’t touch your face! This is a good rule of thumb all year round but especially important if you’re looking to prevent and get rid of pimples in the winter. It can be tempting to peel or scrub off “flakes” with fingers or exfoliating products and tools. Unfortunately,—unbeknownst to many—exfoliating dry skin can cause more acne breakouts by making your skin thinner, more irritated, and sensitive. Instead of trying to “slough off” dry skin, focus on adding moisture back into the skin and prevent further drying. If you use a topical acne treatment cream, experiment with reducing the quantity and frequency you apply it while increasing the amount of moisturizer you use to restore a good balance of oil production. Additionally, if you have dry skin, use these tips when removing makeup and more about acne and dry skin here. 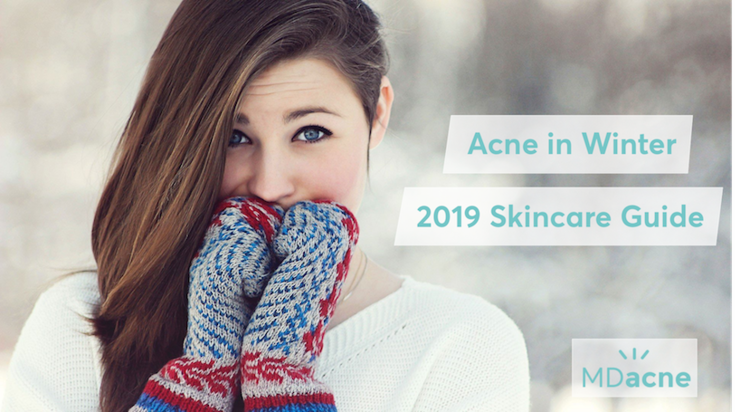 When it comes to treating acne, you can (and should) use the same, proven-effective acne-treatment ingredients such as benzoyl peroxide and salicylic acid all year round—including the winter. The key is in the formulation of the products (% of active ingredients) and how they are applied to the skin. Use the logic above to prevent over drying and consider switching to a less potent treatment cream during the winter months. One of the benefits of MDacne products is that they use micronized forms of Salicylic acid and benzoyl. Users also have access to free fine-tuning of their product ingredients through their treatment and can switch to more or less potent variations of their customized formulas as needed. Learn more about the benefits of micronized benzoyl peroxide and salicylic acid here, which are less drying than standard versions. When choosing a moisturizer—a key product to go along with your topical acne treatment cream—you want to make sure it contains ingredients that are non-comedogenic (won’t clog pores) and help to lock in moisture. Our dermatologist-favorite “secret ingredient” for effective moisturizers (especially during winter) is called Dimethicone. As a member of the silicone family, Dimethicone is hypoallergenic, non-comedogenic, and won’t sensitize the skin. It helps to offset any dryness from harsh winter conditions without adding a greasy finish to the skin. Retinoids—both prescription and over the counter (ex. products with the ingredient, Adapalene)—can be extra tricky in the winter as they already have a drying effect on the skin on their own. If you struggle with dry skin & breakouts, consider removing and replacing retinol-based products from your skincare routine—at least during the dry, colder, winter months. Bonus Tip - Why it’s important to wear SPF during the winter! Heading out for a ski? Going on a cold-weather hike? can’t resist a frigid, outdoor jog? We love the idea of getting outside all year round but many of us neglect to take the same skin precautions in the winter as we do in the summer. If you’re heading out for an extended period of time, make sure you apply a broad-spectrum, UVA/UVB, oil-free sunscreen with SPF 30 (higher SPF sunscreens are thicker and can clog pores!). This is especially important at altitude with increased exposure to UV rays. Read more about why you need to wear SPF this winter in this recent Vogue article.